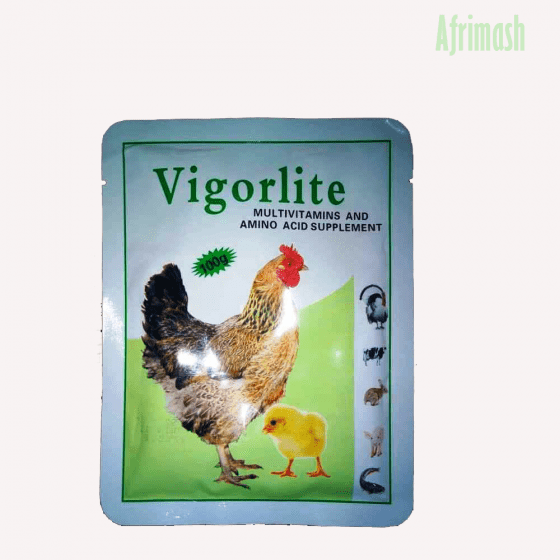 This is a water-soluble multivitamin and also a feed grade supplement that supplies the essential vitamins and amino acids needed for the optimum growth and performance of poultry. This product is beneficial as it serves a range of livestock including; poultry, fish, swine, rabbit, and dog. This product is a general vitamin and amino acid supplement for all kinds of livestock with the following features. Essential nutritional supplement for chicks from day-old till the fourteenth day of life. It can also be fed to chicks till they are 4 weeks of age. Fish: 100g medicates 200kg of feed. Alternatively, 100g should be dissolved in 20 litres of water which can be used to medicate 1000-2000 cubic litres of water. At Vetneeds, we ensure our customers have the best variety of equipment and veterinary pharmaceuticals to choose from. Our products are available for nationwide delivery.